Susan Khaljie and Dior in Australia! 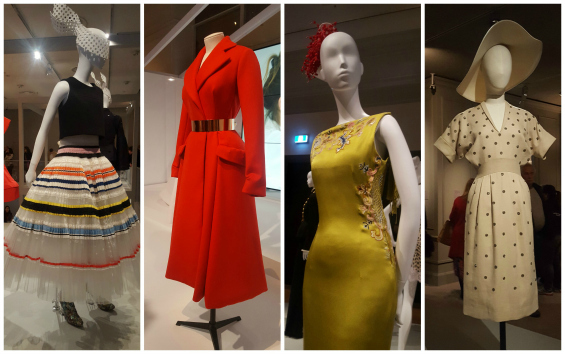 I've just spent an amazing weekend in Melbourne with a big group of like minded sewers seeing the House of Dior exhibition at the National Gallery of Victoria (as well as a little bit of fabric shopping and a lot of eating and drinking!). Image via Mel @whatpiggydoes - organiser extraordinaire! 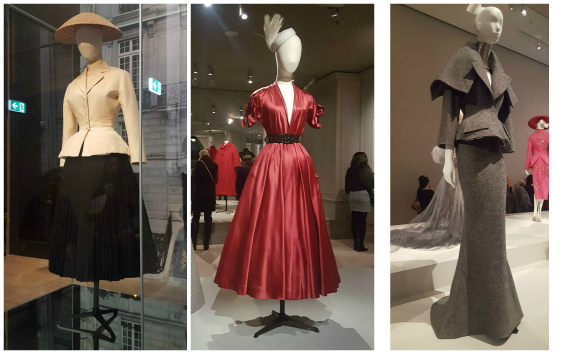 So many amazing dresses, hats and shoes, ranging from the early years of Dior through to the current designer Maria Grazia Chiuri. If only my lifestyle were more glamorous, I would so be making copy cat garments right now! Well maybe that sundress at the far right in the photo below would work for me, but that beautiful stripe skirt on the left is a lot beyond my skill set - apparently had the ribbon sewn on to organza and then the fabric was professionally pleated to get that amazing fullness. The interesting thing that I noticed though is that close up some these garments aren't perfect at all. Sure, the tailoring, the cut and the drape are impeccable but I did spot a scallop finish on a pocket that was a bit jagged rather than curved and a centred zipper that was rather ripply. If I had made those garments I would definitely unpick them and re-sew them, which only indicates to me that we are way too harsh on ourselves! But, there is a lot to be admired in a beautifully made couture garment and the amazingly talented and knowledgeable Susan Khaljie is heading back to Australia again next year for another round of couture sewing workshops. Once again supported by the Australian Sewing Guild (members get a 10% discount), she'll be heading to Sydney, Melbourne, Brisbane and Fremantle in January to March 2018. Having recently finished my version of the Classic French Jacket (with plans for another one eventually) I can highly recommend her workshops. Even doing just a two day workshop on couture techniques taught me so much, and they are skills that I use in my everyday sewing even when I'm not sewing a couture garment. Sharon over at Petite and Sewing has done a few posts giving a detailed review of the course we both did earlier this year - from that you can see how intensive and how much hard work the workshop is, but it's also lots of fun and inspiring spending your days with Susan and the other equally passionate students. It's not very often that we are spoiled with so many opportunities here in Australia - I always see people going to fabulous exhibits at the V&A or attending workshops at the FIT both of which are sooooo far away from Australia. I don't know why I torture myself following these on Facebook when there is no chance I'll get to attend! Sadly I don't think I'm going to be able to make any of the workshops this year as I will be having a busy end of the year and equally busy start of next year but if you're free and able I can highly recommend making the time to see the exhibition and attend Susan's workshops.